Wading River, New York, U.S.
Adam Conover (born March 2) is an American comedian, writer, and television host. He is the creator and host of the half-hour truTV show Adam Ruins Everything, which is based on the CollegeHumor series of the same name. 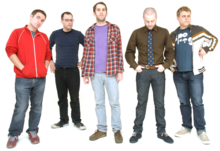 Members of the sketch comedy group Olde English. From left to right: Ben Popik, Raphael Bob-Waksberg, David Segal, Caleb Bark, and Adam Conover. 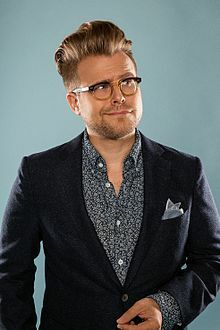 Adam Conover was born in Smithtown, New York, and grew up in Wading River. His parents are David O. Conover, a marine biologist, and Margaret Conover (née Howard), a botanist. He also has a younger sister, Emily, who holds a PhD in particle physics and is a science reporter, which has led him to describe himself as "the only member of the family without a Ph.D." In 2000, he graduated from Shoreham-Wading River High School, where he became interested in the performing arts. He then attended Bard College, where, in 2002, he became an active member of the sketch comedy group Olde English. In 2004, he earned a bachelor's degree in philosophy from Bard College. In 2012, Conover began working as a sketch comedy writer for the comedy website CollegeHumor and on CollegeHumor's YouTube channel, where he eventually created the web series that would go on to become Adam Ruins Everything on TruTV. His show aims to reveal untold and hidden facts about everyday goods and services, and to dispel common misconceptions. The first episode of the truTV version premiered on September 29, 2015. Conover has said his character in the show is a comedic interpretation of the person he worries he once was and/or is. As he told the New York Observer, "It’s the reaction I’ve gotten my whole life: that I learn something and try to tell people in conversation, but when I tell them, they are annoyed." In March 2016, he gave a talk at a marketing conference arguing, among other things, that millennials don't really exist while in 2018, Conover was the headliner of the first night of the annual CSICon conference for skeptics. He currently works in Los Angeles. He also voice acts several characters in the animated BoJack Horseman Netflix series, including A Ryan Seacrest-Type, one of the Paparazzi Birds, and Bradley Hitler-Smith. Conover was once a roommate of BoJack Horseman creator Raphael Bob-Waksberg in New York City. He is a teetotaler, having quit drinking in early 2018. His long-term partner is illustrator Lisa Hanawalt, to whom he was introduced by Bob-Waksberg. ^ Lloyd, Robert (26 September 2015). "TV Picks: 'Late Show,' 'My Brother's Bomber,' 'Adam Ruins Everything'". Los Angeles Times. Retrieved 11 October 2015. ^ a b Barkley, Giselle (24 September 2015). "North Shore native ready to 'ruin' truTV". The Times Beacon Record. Retrieved 19 October 2015. ^ a b c d e Lovece, Frank (28 September 2015). "'Adam Ruins Everything': LI's Adam Conover creates witty truTV humor series". Newsday. Retrieved 11 October 2015. ^ a b Champagne, Christine (29 September 2015). "Spoiler Alert: Adam Conover Hilariously Dispels All Your Beliefs To Teach You a Lesson". Fast Company. Retrieved 11 March 2016. ^ Weissmueller, Zach (21 February 2016). "What You Think You Know Is Wrong". Reason. Retrieved 11 March 2016. ^ Smith, Nicole (8 October 2015). "Watch as this Shoreham-Wading River grad 'Ruins Everything'". Riverhead News-Review. Retrieved 11 October 2015. ^ Genzlinger, Neil (24 October 2016). "Adam Conover Turns a Skeptical Eye to the Presidential Campaign". The New York Times. ^ "The Exquisite Corpse Project". Bard College. Retrieved 30 September 2017. ^ Susan, Gerbic (29 August 2018). "Adam Does Not Ruin Everything—FACT!". Skeptical Inquirer. Retrieved 29 August 2018. ^ Hendrickson, Paula (2017-06-07). "TruTV's 'Adam Ruins Everything' Promotes Facts in the Age of Fakery". Variety. Retrieved 2017-10-09. ^ Grant, Drew (29 September 2015). "'Adam Ruins Everything' Creator Adam Conover on Making Difficult Truths Into Comedy". The Observer. Retrieved 21 August 2016. ^ Singer, Sarah (21 March 2016). "This Comedian Just Obliterated All Stereotypes About Millennials in One Presentation". Mic. Retrieved 25 May 2016. ^ Fidalgo, Paul (2019). "Parasites and modern mind control". Skeptical Inquirer. 43 (2): 15. ^ "Adam Conover". www.adamconover.net. Retrieved 2018-04-23. ^ Conover, Adam (2017-05-02). "Yep! I also play Bradley Hitler-Smith, aka Ethan from Horsin' Around!". @adamconover. Retrieved 2017-10-02. ^ "Adam Conover Of 'Adam Ruins Everything' Is Loving RSS Feeds Again". 23 April 2018. Wikimedia Commons has media related to Adam Conover.